French provocateur Gaspar Noe doesn't do anything halfway so you'd better believe that when the director sets off to make a "dance" movie, he goes all in. As such, the first half of Climax plays like a really well-made dance movie complete with superbly talented dancers, stupendous choreography from up-and-coming superstar Nina McNeely and one of the best dance soundtracks of the year. Climax opens with the end credits, followed by an introduction to the 20 dancers who are being interviewed for the job of their lives: the chance to be in a music video that could elevate their careers to the next level. The next time we see the dancers is during a jaw-dropping dance sequence that is as good as anything on display in popular dance movies. While waiting for the bus to pick them up, the group dances, eats and drinks from a punch that is laced with something which seriously distorts the dancers' perception of reality and what begins as a harmless high turns ugly in a heartbeat. For his descent into hell, Noe's elicits the help of regular cinematographer Benoit Debie who brings his trove of unique camera angles to capture Climax. The opening dance sequence is wonderfully joyous but when the movie takes a turn for the worse, Debie and Noe opt for trademark off-kilter angles, eye-of-god crane shots peppered with POV shots that drop us into the middle of the action. It's a smorgasbord of visuals to create a sensory overload that only adds to the feeling of unease as the movie progresses. This time around, we're also granted Sofia Boutella as the sole professional actress in the mix of dancers. For the most part, the untested actors do a fine job and it's clear that their roles are basically riffs on themselves but the majority of the heavy emotional lifting is done by Boutella who delivers on both the dramatic side and the physical performance. I'm still not certain what the point of Climax is. The movie feels like it might be a lash against American pop culture; Noe makes more than one pronouncement about being proudly French, but during their interviews, some of the dancers talk about how going to America would be the ultimate step-up of their career. I'd be interested to, on second viewing, observe if those dancers are the first to go. If you tilt your head and squint a little, one could also make the argument that the movie is a severely twisted meditation on obsession and the cost of success though I feel that these themes are so on the fringe that I may be pulling at strings that might not be there. 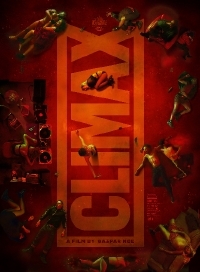 As it stands, Climax is both a twisted bit of fun, easily Noe's most accessible film and also a title that will entice back fans who may have given up on the filmmaker after Enter the Void or Love. It also happens to be one of the better dance movies of the last few years and one arthouse fans don't have to be ashamed of liking.